John’s Gospel is rich in metaphor. A key verse in our text today is v. 6: Jesus used this figure of speech, but the Pharisees did not understand what he was telling them. One would think that Pharisees could understand the protecting love metaphors of gates and sheep, given their culture and biblical history. Sometimes the religious leaders fully understood the parables of Jesus (Matthew 21:45), but they were confused here—in fact, Jesus had told them that they were spiritually blind (John 9:41). Jesus underlined the significance of his teaching with the phrase, Very truly (vv. 1, 7). He used the metaphor of gate five times in these verses. First he pointed out the importance of the gate. Next he claimed (twice) to be the gate (or door). Gates in the ancient world were vital. They were the guardians of protection for a city as well as the happening place for commerce, debate, and sometimes even court. In this occasion the gate is metaphoric and refers to the salvation that Jesus brought. The claim that Jesus was making is exclusive. If he was the gate, the implication is that there is no other gate. 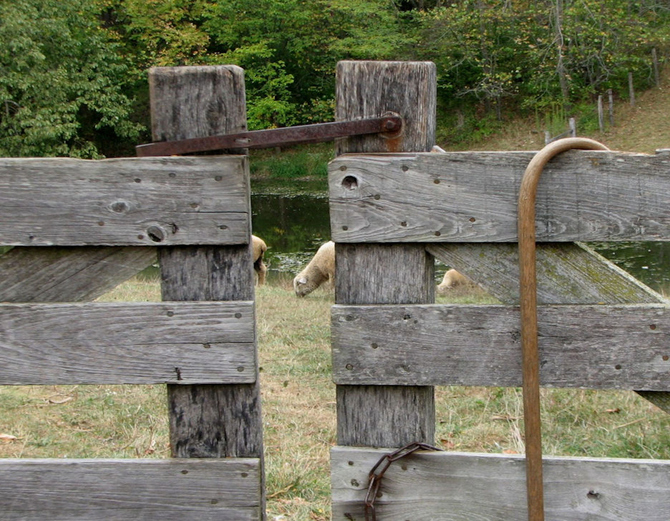 Two other items matter to this gate metaphor, namely the sheep within the gate and the opposition outside of the gate. The opposition to the sheep is characterized with five titles: robber, stranger, thief, hired hand, and wolf. While some suggest that thief and robber might be a reference to the godly predecessors of Jesus such as the prophets and John the Baptist, the more traditional view from the context is that the opposition to Jesus came from the counterfeit leaders of Israel. In fact they actually seem to be doing the wolf’s (devil’s) business. By being the gate, Jesus grants protecting love to his sheep. In Jesus’ world the shepherd often functioned as the gate. The shepherd would lie down at night in the gateway of the sheep pen. When day came the shepherd would rise up from the gateway and lead the sheep out for the day to find food and water. There developed therefore an intimacy between shepherd and sheep. The sheep listened uniquely to the shepherd’s voice and experienced the freedom (come in and go out) that he gave. On the other hand, this gate/shepherd called his sheep by name, brought them out of the pen, and led them to pasture. Jesus said it best: I am the gate; whoever enters through me will be saved. The intimacy that shepherd and sheep share is similar to that shared between Father and Son (vv. 14, 15). Jesus is not only the gate, he is the good shepherd himself. This claim of being the good shepherd is mentioned twice. Jesus not only being the gate but also being the shepherd has been earlier introduced in vv. 2-3: The one who enters by the gate is the shepherd of the sheep. The gatekeeper opens the gate for him. Perhaps the gatekeeper is an under shepherd of the good shepherd (see also 1 Peter 5:1-4). The metaphoric connection in this section is that the good shepherd actually lays down his life for the sheep. In Jesus’ day shepherds would protect and defend their sheep. But rarely would a shepherd die for the sheep. After all, it is a sheep. This is where the metaphor gets extended beyond normal connections (just like a parable sometimes goes beyond reality to seeming fiction). Anyone who knows anything about the dominion mandate (Genesis 1:26) would know that sheep serve shepherds—not the other way around. But the good shepherd is not at all like the counterfeit rulers of Israel (hired hands who enable the wolf to pick off the sheep). We should understand this laying down of life in its literal sense. No one took Jesus’ life (John 10:18). When he was arrested he willingly let himself be incarcerated (John 18:4-9). When he was crucified he was silent before his shearers (Acts 8:32, 33; Isaiah 53:7, 8). What distinguishes this shepherd is his sacrifice for his sheep. The gate leads to life. The sacrifice leads to life. At the center of our text is a great incarnational statement. The gate/shepherd came to give life so that we could have it to the full.